BIBLE COMP WINNER 4-band EQ (or 3-band), up to 4 Remix Decks (or other flavors), 2 or 4 FX. For use with an S4 MK1/2 controller and extended/normal keyboard. Designed to ease your performances and help prevent mistakes. Tested, comprehensive, and easier to remember. Visual Guides and fully documented. 11.19.2018 – Back with a GA release for Traktor Pro v3 using S4 MK2. The S4 MK3 is not currently user mappable unless you use a midi approach with the Controller Editor - not for the faint of heart! This release revises the use of Filter with the XoneEx mapping, in light of the TP 3 rework of Filter - it now engages different pre-selected Channel FX (effects) in TP v3. Also reworked some opp deck mappings to be more intuitive. such as Slot Volume or Filter. You must be logged-in to rate a mapping. I would be grateful for your comments regarding bugs, feature requests, or anything else. I will try to include them in future updates. It's not possible to map an output to the loop size indicators. It could be that NI just didn't include this in the mapping editor (so the editor is the issue), but I suspect that the actual signals differ. Hopefully NI will make the full range of what's done in the Default mappin mode available to User-only mappings, and soon! I have finally completed the visual mapping guides, and made numerous improvements to the mappings themselves. Please take a look and let me know what you think! This is a seriously sweet mapping and could not have come at a better time! I just imported TSP2S4Controller4Band2.0.2.1GA.tsi using the big fat import button and everything "just works"! Many thanks and kudos! Still a couple of bugs left in browse mode, now fixed,. I will upload soon. I've worked out a 4 Sample Deck mapping for the extended keyboard, and will include this in the next release. The S4 can be mapped for this as well, though it's going to take awhile, ~100 new or changed entries! The 2.0.2.3 release is here! 4 Sample D3cks are now supported, have fun! Minor documentation changes uploaded today, no change in the Configuration. Look for a new release very soon! Bug fixes, some additional commands, and revised treatment for Sample Decks. Wow you have been busy! I'll download the latest and give it a spin this weekend. Updated for 2.0.3 product release. The latest mapping seems to be OK. One thing that I miss a bit is the high resolution jogs but I understand this is a Traktor issue. However is there anything that can be done to make the jogs a bit more sensitive? Jogs to be more or less sensitive. Hi do you have any pointers on how to change the individual command mappings? Do I need to edit the TSI file and if so which fields would I want to edit? Thanks for all you're hard work on this mapping, I love it! Glad you found it helpful! I'm not sure if your familiar with the basics of mapping edits, you start with the Preferences > Controller Manager. Oh I just figured it out! "Seek position" was what was needed. Adjusted the acceleration and now I am happy! I will be publishing an update for the latest Traktor 2.1.1 release shortly. It looks like the main differences will be the renaming / removal of some of the sample-related commands. Stay tuned! It seems the "Seek position" is no longer working in the mapping. When a track is playing I can no longer alter the phase,etc. Anyone else seeing this? PS: Not working in 2.1.1 update is what I meant. commands for Keylock,FX Enable and Headphone Cueing. Added minor refinements to the 2.1.1.0 release, mostly a rework of the keyboard mapping for better consistency. Added mapping for new Slot-specific commands: Slot Keylock, FX Enable, and Monitor Cue! Were you having a problem with the Tempo Bend (no shift) commmand, or with Jog Turn (opposite shift)? phase of the left jog wheel. Any ideas? New update is working great! Thanks!! 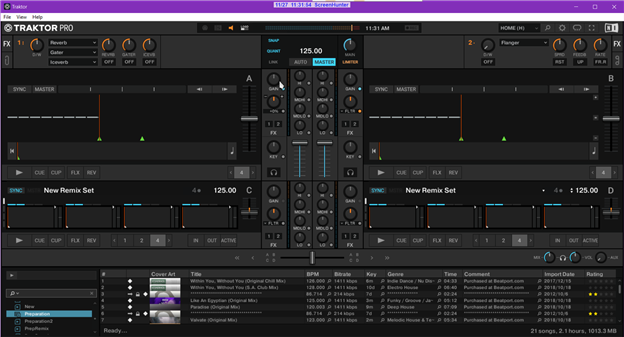 Ever since Traktor 2.1 this mapping lags extremely bad on the jogs. 2.0.3 works perfectly. 2.1.2 also has the major lag. Anyone else seeing that? Interesting, I hadn't noticed anything remarkable on 2.1.1, have not tried 2.1.2. If there is any difference then it seems most likely related to the S/W not the mapping. I note that with a User-defined mapping you can't access the hi-res functionality. There where a couple bugs filed for this issue - if you are using 2.1.X and have a few minutes call NI support and ask that the "relevance" be bumped a bit so we can get this on the developer radar sooner than later. After a major effort, I have mapped the new features and changes brought in with the 2.5.1 release. Enjoy!